My fiancé and I were looking for someone who could help us in a unique way. Her diamond was an heirloom from her great grandma and about 100 years old from Italy where her grandparents lived. 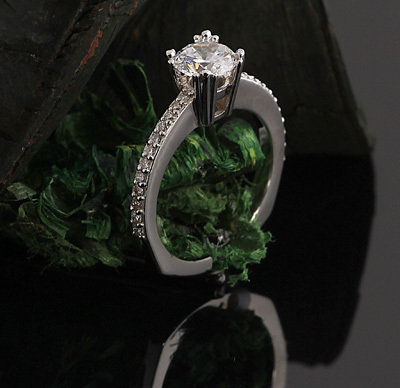 We needed a jeweler that would be able to not let the diamond out of our sight. You'd think this would be a simple task, however, we quickly realized not many jewelers allowed such a request. Understandably so. Fortunately, we crossed paths with Albert Kaz and it was the best thing that could've happened. He was very understanding of our situation and was more than willing to allow us to be there every step of the way, from taking the diamond out to putting the diamond in. He customized my fiancées ring to exactly what we imagined and it came out beautifully. He also appraised the ring with the diamond in the new setting and normally this is something that has to get sent off to a lab. But he was able to do it for us. So if your looking for someone who is nice, helpful, patient, trustworthy and does amazing work then go with Albert Kaz. He's truly the best thing that happened to us in my search for the perfect compliment to my fiancées diamond heirloom. Her ring is one of a kind because it was made by Albert Kaz.